Replacing Older Counters with a Granite Countertop? If your faucet is old, you might not be able to re-use it. Many older counters are thinner than the typical thickness of the granite installed in the Austin area. Most of the granite found in Austin is 3cm thick (3 centimeters, or about 1.18 inches). 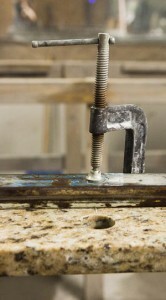 Many older faucets don’t have enough threading to clamp on properly to the thicker counters. Confused? It’s not nearly as hard as it might sound to figure this out. Here’s how it went: old counters were often made from thinner material, so faucets were made to fit them. Newer counters are often thicker and some (but not all) of the newer faucets are designed to fit onto thicker counters (while still fitting on thinner counters, too). Your best bet is to put in a new faucet when you replace your old counters. The old one will just get taken out still attached to the counters. If you want to save it for some other project, you can remove it before the counters are hauled away. 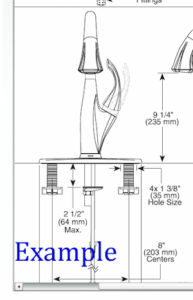 How Do You Figure Out if the Faucet Will Fit on New Granite Counters? You can take off the old faucet and see if it has enough threads for a thicker granite counter (1.18″ or more). 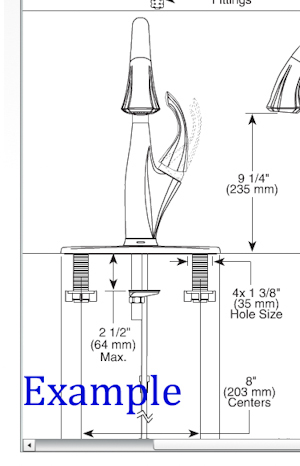 You might have the technical specifications sheet that came with the faucet and it will show the maximum counter thickness the faucet can handle. The line-drawing on the left gives you an idea of what to look for. You might look up the faucet model number on the manufacturer’s web site and look at the diagrams they have on-line, or you may want to call their customer service number and ask. If you are not certain your old faucet will fit, you might want to buy a back-up from a local big box store and have it on-site on the day your counters are installed. That way if your old faucet won’t work, you have another one. If you don’t need it, you can take it back. We need the faucet on-site before we drill the holes (one to four of them) so you don’t have to arrange for a service call later for us to come back and drill the holes. (Plus, you will probably want your plumber to hook up your sink and faucet as soon as possible so you can start using your kitchen (or bathroom) again! !